Q1: How far will an aircraft have to fly from the Base to the Remote Landing Site? A1: The flightpath length from the Base to the Remote Landing Site will be between 20 km and 30km. Aircraft must return to the Base from the Remote Landing Site the same way (but in reverse). So the total round trip flight path length of an aircraft that flies to the Remote Landing Site and back will be between 40km and 60km. Q2: Can the mobile phone network, or a satellite network be used for aircraft-GCS communication? A2: Yes, but teams must accept that there is a reliability risk, and that a team’s safety case (part of Deliverable 3) will have to account for the risk of losing/leaving coverage. Q3: What is meant by an Autonomous Landing? A3: An aircraft or device that lands on the ground without user input, other than an instruction to land (which maybe contain a single manually designated GPS coordinate for example), is considered to have landed autonomously. Q4: Can the Support Aircraft pick-up the Retrieval Aircraft or a Retrieval Device from within the Remote Landing Site? A4: Yes. However, the button press by Outback Joe on the Retrieval Aircraft or Device must initiate this pick-up. Q5: If two aircraft are used, Can one aircraft act as a communication relay for the other? Q6: Can a winch from a flying aircraft be used within the Remote Landing Site as part of the mission solution? A6: Yes, as long as a winch cable or the load attached to the cable does not come within 30m of Outback Joe while either is attached to the flying aircraft. A flying aircraft or anything attached to a flying aircraft must not come within 30m of Outback Joe. This means that any aircraft that is attached to the sample receptacle must have landed or released the receptacle before Outback Joe will place the Sample. 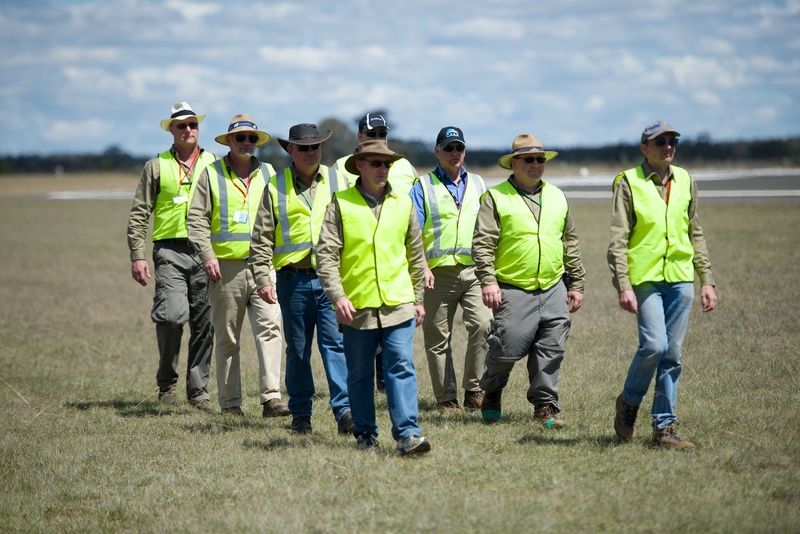 Q7: Will Outback Joe be allowed to reposition a landed Retrieval Aircraft or Device to a desired orientation as per instructions written on the outside of said Aircraft or Device? A7: No. The only actions that Outback Joe will carry out will be to place the Sample into the Aircraft or Device and press the Arming Switch. Q8: What is the maximum number of team members allowed? A8: There is no limit on the number of members in a team. However, there is a limit of six team members in the active Base competition area. Q9: Do the UAV Challenge organiser’s cover any costs of the teams? A9: No. Teams must fund their own entry in full. Many teams in the past have secured sponsorship to cover some of their costs. Teams should also be aware that they will need insurance to compete at the event. Q10: Can aircraft be powered by a combustion engine or engines? Q11: When the aircraft lands at the remote landing site, would a clutch system (in the event of a gas or turbine driven rotary wing platform) be sufficient to render the aircraft safe to approach, or would the engines have to be completely powered off? A11: This should be addressed in a team’s Safety Case but safely implemented clutch system to remove the possibility of any blades moving is acceptable. Q12: What is the requirement for a loss of communications link from the aircraft to the ground control station? A12: Teams should identify that loss of communications is a risk in the D1 Risk Assessment and document the planned response of their system in both their D2 Risk Management plan and D3 Safety Case. Loss of communications is an abnormal condition that must be responded to, but is not an emergency. Immediate flight termination is not mandated. The rules do not mandate a specific procedure in response to loss of communications as a single procedure is unlikely to account for the variety of possible system configurations, such as different aircraft roles and capabilities, that may be used to attempt the UAV Challenge. Q13: If flight termination is activated on a rotary-wing aircraft, can the aircraft be programmed to descend in a controlled manner instead of cutting the power to the blades? A13: Crossing of the geofence boundary must always result in immediate cutting the power to the blades. Teams may propose, with a supporting safety case, the implementation of a soft flight termination mode for non-geofence activations of flight termination that will lead to a powered descent. Activation of full flight termination with engine cut must still be possible after this soft flight termination. Q14: What is the width of the Transit Corridor? A14: The width of the Transit Corridor will not necessarily be constant along its length. Its shape and width will be defined by the constraints of the flight area. However, we can say that the Transit Corridor will not be narrower than 500m at a way point location (250m minimum distance from the boundary to the way point) to allow for manoeuvres around the waypoint. Q15: Can we use military grade transmission systems to autonomously control the aircraft? A15: There are no specific restrictions on the grade of equipment, however technology used should be affordable and ultimately realistic for the civilian market (Section 5.1 of the rules). If a piece of equipment is of very high value or restricted to military only users this would therefore not be suitable. Transmission equipment must also comply with ACMA regulations and teams must hold any radio licences required to legally operate the equipment in Australia. Q16: Is there an entrance fee? Q17: How close can a flying aircraft come to Outback Joe? A17: The aircraft must not come closer than 30 metres in a straight line from Outback Joe. This can be visualised as an exclusion zone around Outback Joe in the shape of a hemisphere with a 30 metre radius. Q18: Must the retrieval aircraft have an active communications link to the Ground Control Station all the way to the ground (i.e. at the Remote Landing Site)? A18: Yes. Continuous communication is required between all aircraft and the Ground Control Stations located at the Base. This includes aircraft that have landed at the Remote Landing Site. Aircraft may not take off from the Remote Landing Site without active communications to the Ground Control Station. Note that the communication link does not need to be point-to-point and may be achieved using other aircraft, mobile phone networks or satellite networks. [Update 24/11/15] Teams have commented that autonomous aircraft should not require constant communication systems. Improvement in the state of the art of UAV autonomy is one of the motivations of the UAV Challenge, but the competition needs to be able to run under the current regulations. We need approval from CASA to run the event (operating beyond the line of site of the operator and above 400 ft) and CASA’s expectation is that there is a continuous communications link between the remote pilot and the aircraft. Although we wish to motivate and demonstrate Type 2 Autonomy, the competition must be run with Type 1 Autonomy in order to be permitted. In essence all of the competing aircraft are experimental aircraft being developed and operated by unlicenced operators with limited experience in this scenario, so continuous monitoring of the aircraft seems reasonable. At the end of the day, autonomy does not imply no comms or loss of situational awareness for the remote pilot. The RFD900 was created to fill the void in telemetry radios in the original UAV Challenge Search and Rescue mission. We hope that similar amazing new solutions are created to solve the GCS to remote ground communications issue. Q19: After landing at the Remote Landing Site is it possible to taxi the aircraft to the required place (in the case that the aircraft lands outside the 80m radius circle from Outback Joe)? A19: No. The rules clearly state that “Upon landing, the aircraft must automatically remove power from any propellers making it safe for Joe to approach.” The intention is that power is removed as soon as landing is complete. Taxiing (using powered wheels) is likely to be impossible due to the ground conditions and will not be permitted. Q20: Can a company enter a team into the UAV Challenge Medical Express competition? A20: Yes, as per the rules. Q21: Will teams have access to mains power for their GCS at the Base? A21: Yes, teams will be able to plug their ground stations into Australian standard 240VAC supply. This will be supplied from a generator. Q22: Will Outback Joe be a real person or a dummy? A22: Outback Joe will be a dummy (standing) when the competition aircraft is searching, approaching, landing and taking-off. This is safety requirement. A human Outback Joe will place the blood sample into the aircraft but only when power has been removed from the aircrafts propulsion system (as per the rules). The dummy version of Outback Joe will not have an artificial thermal profile to match a typical human. Q23: Can any part of the recovery aircraft be left behind at the Remote Landing Site (e.g. a parachute)? A23: Yes, its is acceptable to leave parts behind within the Remote Landing Site. Q24: If more than 20 teams are given a Go for D3, will there be a “waitlist” should one of the top twenty teams withdraw from the UAV Challenge prior to the event? A24: Yes. All teams that pass the D3 milestone will be ranked according to their D2 scores. The top twenty will be invited to the competition event. If a team withdraws (for whatever reason) the next team outside the original top-twenty will be invited to the event. If they can not accept this invitation then the next team will be invited, and so on. Q25: Will there be line of sight, or near line of sight, between the Base location and the UAV during it’s entire flight? A25: The mission area will be typical Queensland farming country and will be relatively flat. There maybe some small hills, trees, etc. Line of sight depends on the altitude of the remote aircraft and of course there will not be line of sight between the Base and the Remote Landing Site as those two locations will be between 10km and 12km apart. Q26: Is this competition suitable for a fixed-wing type aircraft? A26: No. It is highly unlikely that a conventional fixed-wing aircraft will be able to land at the Remote Landing Site. The space available at the Base may also be very limited and teams should not assume that runway style takeoffs and landings will be possible. Q27. Can Outback Joe be the one to make the decision that it is safe to take off ? A27. Outback Joe can only make this decision at one moment in time and after that he has no ability to control the aircraft. If the aircraft does not behave as expected when taking off, or if another aircraft enters the vicinity after he has pushed the button, he has no ability to do anything other than hide. Outback Joe’s control input to the aircraft is not intended to be about safety of flight, but about indicating that the sample is installed and Outback Joe is about to clear the area. Q28. We know we can use two aircraft now to complete the mission, but is using an RF relay aircraft really a good idea? A28. It is up to each team to determine if using an RF relay aircraft will increase or decrease the overall risk and likelihood of success. We have not made a recommendation either way, but have included the possibility in the rules so teams can consider it. Q29. Will a small aircraft be assessed as safer than a large aircraft? A29. The D2 report and the team interview each have scoring components for risk assessment and management and safety approach. The team’s choice of aircraft will affect the risks and what they need to do to manage them. A team that uses a large aircraft is likely to have higher consequences to manage and if they do not manage them well enough will consequently be scored poorly, or not permitted to fly. The scoring is therefore about the safety of the entire approach and risk management, not just about aircraft selection. Choosing a safer aircraft can of course be an important step in developing a safe solution. Q30. What is the minimum flight altitude allowed for all aircraft? A30. There is no direct limitation for minimal flight altitude, but there is an indirect one. The UAV Challenge transit corridor is over farm land and roads that are not populous, but they are not devoid of people and are actively used. CASA regulations stipulate that UAVs must stay at least 30 metres away from anyone not directly associated with the operation of the aircraft, so while flying in the transit corridor the UAV will need to fly at least 30 metres aways from anywhere that a person could be, which is anywhere on the ground. This implies that the UAV must operate at least 30 metres above the ground anywhere in the transit corridor. At the Base and the Remote Landing Site the aircraft will need to fly below 30 metres when landing or taking off but should fly above 30 metres AGL at other times. Q31. What will happen if a team’s Deliverable 2 contains the required details regarding their system’s response to failure conditions, such as loss of GPS, but the Technical Committee are not satisfied that the team’s solution is adequate or as safe as it could be? Will the team be given a No-Go? 1. Go: The team have satisfied the Technical Committee that they are developing a safe solution that complies with the rules and have demonstrated in their video and report that they have made the required progress in developing their system. 2. No-Go: The Technical Committee are not satisfied that the team are developing a safe solution, or the team’s solution clearly breaches the rules, or the team has not made the required development progress, or the team’s D2 does not provide sufficient information to assess their solution. 3. Clarify: In general, the Technical Committee are satisfied with the team’s D2, but some aspect/s of the report require clarification or further information before a final decision can be given. 4. Improve: In general the Technical Committee are satisfied with the team’s D2, but some safety aspect of the team’s solution requires change or improvement before the Technical Committee are willing to allow the team to continue. If, like in the example above, the Technical Committee are not satisfied with the team’s solution for GPS failure they would be asked to Improve their solution, with some specific guidance given. If the team has not specified a response to GPS failure at all they will be given a No-Go (if the Technical Committee can not find the required information they will consult the team’s compliance statement that should have a reference to where in the D2 report the required information is). The more aspects of the D2 that the Technical Committee believe require further information or improvement, the higher the likelihood that the team will be given a No-Go. Q32. Why do we need to have an e-stop on our aircraft and how do we implement one? A32. The functional requirement is to provide: An external, easily accessed and operated method for de-energising the UAV (motors and radios). Preference is for a standard, latching, red, e-stop button with yellow surround. An alternative is an easily removable (without tools) externally accessible safe/arm plug where Red = Armed and Green/Absent = Safe (ESA colours). In the absence of these two options a clearly marked functionally equivalent system(s) may be used subject to Technical Committee approval. Specific details of the e-stop functionally and design should be included in the Deliverable 2 document, not simply a statement confirming such a system will be implemented. The Technical Committee is open to innovation in this area and teams are advised to read FAQ 31 (above). Q33. Is the Support Aircraft required to navigate via the provided waypoints, or does this only apply to the Retrieval Aircraft? A33. All aircraft must follow the prescribed path and track through the waypoints as far as they go noting that some Support Aircraft will be relay aircraft and may loiter mid-way through the full path to the Remote Landing site. On the return leg all aircraft must track through all waypoints they passed through on their outbound leg. Can either aircraft come within 30m of Joe (measured horizontally) while overflying the clearing and searching for Joe and a landing spot? Does the aircraft have to identify outback joe & landing site itself or is this the job of the ground control. Also by “instruction to land” what exactly does this “instruction” include? (ie. exact location of landing site or simply a single command to land and the aircraft have to figure itself out where to land? See Q3. Aircraft must be autonomous. If you read the reason for the 30m it is to meet CASA’s regulations for safety (as stated by the organisers and they want to be safe, otherwise no more Challenges), the 30m is a direct path, its not a horizontal thing (it’s 3D), So as long as your direct path distance is greater than 30m (so doing a low pass at 40m AGL), I would reckon it would be okay as long as you meet the other requirements. If any single component fails would you clear the person/s. In the case of a plane, a servo or motor failure, or even a structural failure would likely see it miss the person. A multicopter, or Trad Heli or VTOL in vertical mode may not, so from a safety standpoint may not meet the smell test. I think you would need to state what the plan is in your safety case. If I was the organisers I would be looking at this sort of understanding in D2 and D3 (and touch on lightly in D1). Are we on the right track organisers? Can we use military grade transmission systems to autonomously control the aircraft..? ?also what is the entrance fee and what is the max number of participants per team..?? 1) (ditto Alan’s q) Does the UAV need to identify Joe and the landing site autonomously using on-board processing, or can it stream data back to the base for the crew to assist with analysis, identification and landing site selection? 2) Does the sample Storage Compartment need to be enclosed? i.e. could it be an open cavity in the upper fuselage that the sample is placed into? It sounds like Outback Joe will be a living, breathing person this time around! Can we assume he is the only person within the Remote Landing Site? No judges, adjudicators, photographers, etc in the zone? i.e. if we have a method of identifying a human in the area within 100m of the GPS coordinates, can we assume it is Joe, or might we need to distinguish between him and others? Considering the deadline is less than 2 weeks away, can we expect submission instructions soon? Does joe have to be identified autonomously or can there be human interface interaction.. Approximately how many people would be around joe..?? Can the UAV Challenge provide any expectations as to what kind of terrain or space will be available for conventional fixed wing aircraft to take-off and land in? We understand that the competition location is not yet selected or confirmed, but are the organisers seeking a location with a relatively open grass field, or perhaps a road, etc to launch fixed wing aircraft from, without the use of a catapult & parachute landing system? Our team is interested in using a 15-20kg class fixed wing UAV that typically requires a strip 50-100m long (although this could be decreased), as part of our overall system, but we are hesitant to take this approach if it could mean disqualification due to it being impossible to utilise in the fly-off. hi , i and my team want to participate in medical express , please guide me for registration ? Will there be near line of sight between the base and the UAV during it’s entire flight? IE the UAV doesn’t have to fly behind a mountain or tall massive building that would intentionally block Line-of-Sight along the transit corridor or at the remote landing site. Will Joe be a human being or a mannequin as it was in last year’s challenge? Are there specific documents, or a format, for the submission of the risk assessment and risk management for D1? When will the mission waypoints and geofence boundaries be provided to the teams? And will they be different for each team? The mission waypoints and geo fence boundaries will be given to the successful D3 teams. Each team will be given the same information. Does this mean that we will know in the end of August the estimated location of Joe? Will Outback Joe have a human’s body temperature? uavchallenge, is it possible to get a reply to this post? Is it correct to say, that no direct limitation for minimal flight altitide is imposed neither by the challenge rules, nor by CASA regulations? It is clear that UAVs must not get closer than 30m to Joe or any private property, and it implies some minimal altitude limitations, but is it everything? In section 3.2.2, it is mentioned that a data feed from the GCS needs to be given to the ‘Range Safety Coordinator’.Is there any specific software that will be used on their computer to decode the data? Is it possible to install a custom software on this computer to decode the data? When will the Compliance Statement be provided to teams for Deliverable 2? To clarify for D2, “Fuel or Li-Po battery management” in the Risk Management section is discussing our safety procedures for transporting/maintaining/storing our power source, rather than “how will you have enough energy to fly for an hour”? Or both? Can the support vehicle be a tethered vehicle? Is it possible to use the observation tower at the Dalby Model Aero Club (DMAC) to setup antennas, or possibly even a ground tethered, telescopic, free standing mast on a tripod? No, we will not be allowing teams to use the tower at DMAC. It will be used by the organising team. In Q19 of the FAQ it disallows retrieval aircraft landing and “taxiing” to get closer to Joe location using “powered wheels”. Does this also include aircraft that taxi using their propellers, or will the point of touchdown be regarded as the point where distance is measured to Joe’s position? If not, then this could potentially allow propeller driven aircraft to “taxi” even after they touchdown, under the guise of landing, to get a closer position to Joe. Also is it possible to taxi using the propeller, after the sample has been placed, to orient to a better takeoff vector? In the end, is it possible to expect, that Joe dummy for sure will be fixed in standing position, or both standing and sitting possible postures should be considered? Out doubts arise from the fact, that in A22 of the FAQ it is stated that Joe will be standing, however section 1.2.5 of the rules (which were issued later) still say that “Joe will be standing or sitting”.